Beer and Summer: two good things that are even better together. Beer and summer are a great combination. What is a great Capital Region combination? Maybe it's a beer or wine and food. Maybe it's two places you'd like to push together. Maybe it's something more philosophical. Just something you think is or could be a good Capital Region combo. 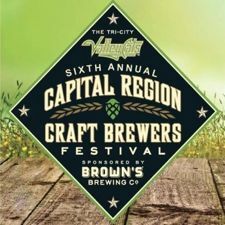 The Capital Region Brewer's Festival is this Saturday, July 25, from 2:30pm to 6:30pm. Tickets are still available and range from a $10 designated driver ticket through a $47 Grand Slam package. Important: All comments must be submitted by 11:59pm today (Thursday, July 23, 2015) to be entered in the drawing. You must answer the question to be part of the drawing. (Normal commenting guidelines apply.) One entry per person, please. You must enter a valid email address (that you check regularly) with your comment. The winner will be notified via email by 10am on Friday July 24, 2015 and must respond by 4:30 pm on Friday, July 24. Beer Belly on New Scotland and loved ones! The classic capital region combo: politics and corruption! Enjoying a slice of cheesecake from Cheesecake Machismo on the Empire State Plaza. Lark St and Washington Park. My favorite combination for the Capital Region has been the city of Troy and NYC aesthetic of new business that have thankfully sprung up in recent years. I love whats been happening there. The addition of a permanent home for the farmers market will be amazing. Being close enough to everything and still being far enough away to escape it all. Biking and Thacher Park- sweat up the hill and enjoy the fantastic overlook! Pick your own at Indian Ladder Farms, then cider donuts and coffee. The view from Oakwood Cemetery and a picnic! Cold craft beer and the greasy goodness of a cheesy slice after a relaxing day on the river. Popeye's Fried Chicken & 6 Miles Water Works. "Six with" and an RC Cola at Famous Lunch in Troy. Cold craft beer and the greasy goodness of a cheesy slice after a relaxing day on the Hudson. Great summer weather & the theater productions at Park Playhouse in Washington Park. Free event that has been entertaining generations in the heart of the city for years! 2 chicken empanadas and that amazing green sauce from Empanada Llama! A fenced in Dog Park (We like Westland Hills Dog Park) and an open bar! A girl can dream. My homegrown heirloom tomatoes and Roma's fresh mozzarella cheese! It would be wonderful to "combine" or pair, if you will, the fall, spring, and summers of ,my beloved Albany with the winters of Bermuda...instead of my reality: spending five months out of the year staring maniacally at my computer background, pretending to be sunbathing on that glorious tropical island featured in the picture, instead of huddled at my desk in my winter coat. swim holes and burger stands. Weekend dinner at the City Beer Hall followed by walking around downtown Albany when no events are going on, eerily quiet and peaceful. Malta Drive-in and fried oreos. Stewart's Ice Cream & Ted's Fish Fry. Craft brew and wings at the Ruck! A beautiful sunset and the back deck of Ryan's Wake. or Crossroads Brewing's 'Outrage IPA' and Defazio's Pizza with their homemade italian sausage. The kids and I like to get lunch to go from Our Daily Bread in Chatham and then wander down the street to a little bench and wait for train to go by while we eat our food. Brunch at The Shop and a Rare Form chaser..